Our holiday in Pulau Weh (Sabang), Sumatra, Indonesia. 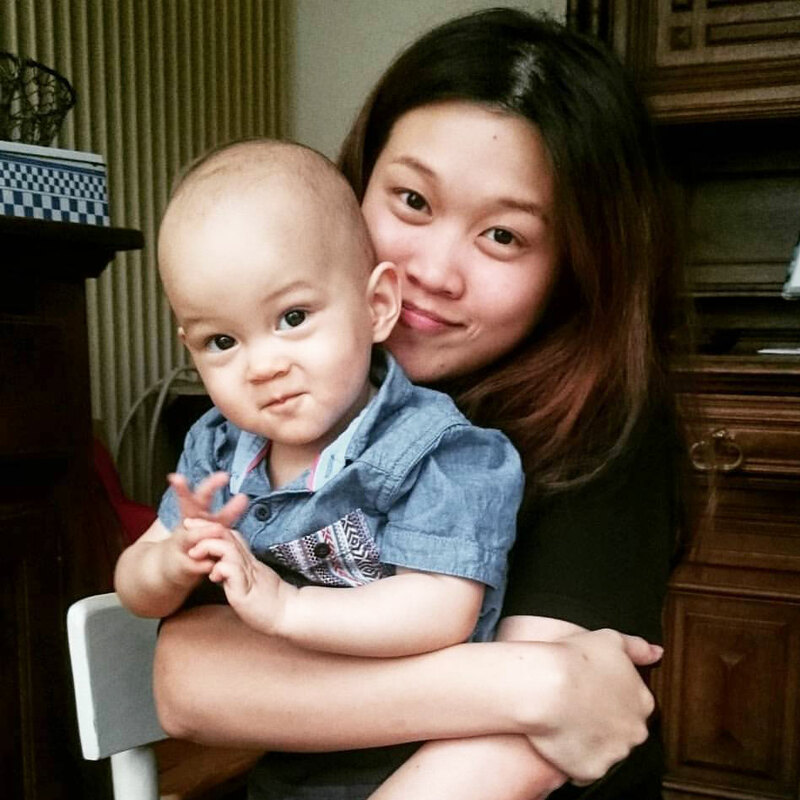 Thank you Joyce for blogging about Pulau Weh, otherwise I wouldn’t have thought of going there for Gareth‘s birthday in March. We had such an amazing 5 days! Pulau Weh or Sabang by the locals, was surprisingly easy to reach. First, an hour flight from KL to Banda Aceh via AirAsia. 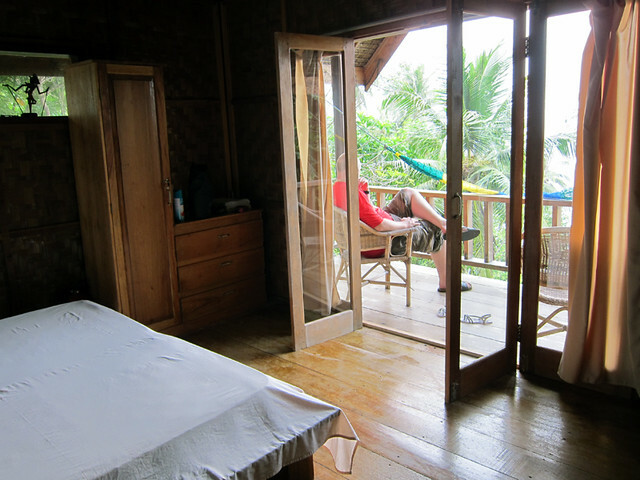 If you’re flying in before March, you would have to stay a night in Banda Acheh. Depending on your citizenship you may have to pay for 30 day visa (at the visa-on-arrival booth in the airport), which is 25USD at time of writing. You can pay in rupiah as well. Malaysians need not worry about the visa as we and the Indonesians are friendly. Since we flew in after March, we didn’t need to stay overnight in Banda Acheh so we took a 1/2 hour taxi ride straight to Ulee Lheu ferry port. Taxi services are abundant at the airport, about 100,000Rp on average. 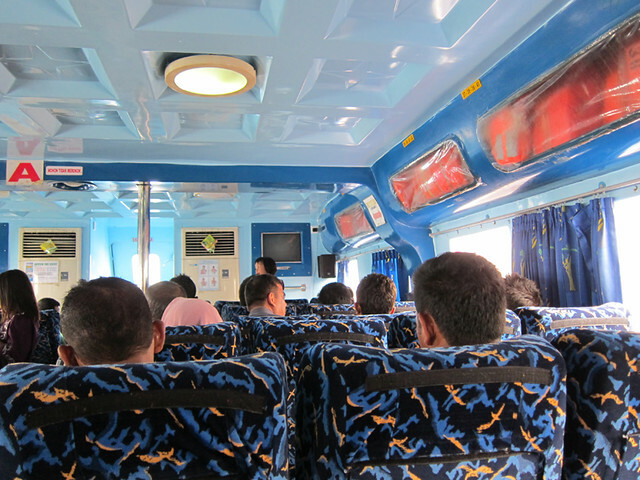 However, we got ours for 120,000Rp which was considered a bit expensive after chatting with some locals but we were okay cause it was a large air-conditioned van which 6’5″ Gareth could sit comfortably in. We also arranged for the same fella to take us back to the airport. 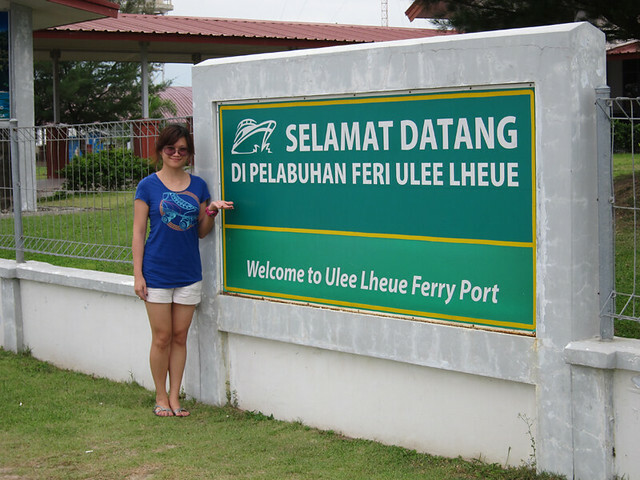 # – Ulee Lheu ferry port, 1/2 hour taxi ride from Sultan Iskandarmuda Airport. 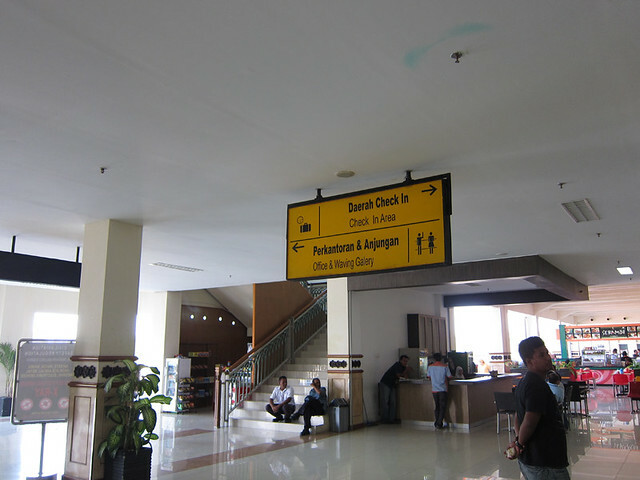 From the airport, you would probably reach just in time for the slow ferry which would take 2 hours to reach Sabang. Instead of boarding the slow ferry, we decided to linger about at the port and have some lunch while waiting for the express 1-hour ferry at 4pm. The tickets for the express ferry started selling around 3pm. You can get discounts for buying a return trip ticket. We got 2 pairs of return executive tickets which basically meant air-conditioning for 220,000Rp. # – Gareth’s first meal in Acheh. Some awesome mixed rice from a stall filled with locals. # – My very first Teh Botol and Mee Goreng Acheh (Achehnese fried noodles). Yums! # – One of the locals drinking coffee from a saucer because the coffee cools down quicker this way. People are really friendly in Banda Acheh! Seriously, it’s the only place where I’ve been winked back at by a kid after winking at one. Normally they just start crying or shy away as if I’m a serial murderer. People are always smiling and saying hi. At first I thought it’s because we’re tourists, but we quickly realised that they do it to everybody! On the road, they honk at every passing vehicle not out of warning or anger but just because they want to say hello. It’s nice! # – The ferry was quite comfortable. We slept the entire journey. Upon reaching Sabang Port, we had to take a taxi for a half hour journey to Pantai Sumur Tiga, where our hotel, Casa Nemo is located. Pantai Sumur Tiga is the longest beach on Pulau Weh and is the quietest side of the island. Our man was Lehman (known as Lehman Becak), a friendly guy who charges really cheap (only 50,000Rp). 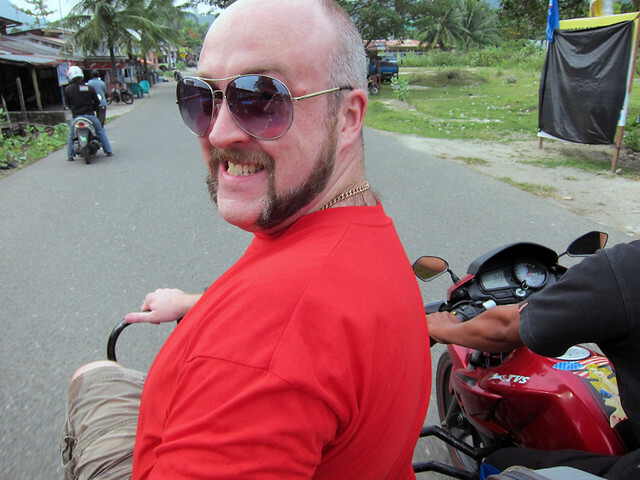 We were shocked at first that our “taxi” was really just a motorbike rickshaw (we had two pretty large luggage) but the experience of riding on one through the villages, up and down the hills of picturesque Sabang was truly fantastic! There are cars and mini buses (called labi-labi) but I highly recommend taking the bike rickshaws to get around on the island. # – Gareth’s happysauce face on Lehman’s rickshaw. # – Nice & spacious room. # – View from our balcony. # – Cows & goats roam free. Really felt very close to nature. By the time we settled down, it was already evening. We jumped into the sea for a bit before heading next door to Freddie’s for dinner, a 5 minute walk away. Casa Nemo’s kitchen only serves breakfast but we’re told by Ferdy the manager that it will be ready for lunch and dinner in a couple of months time. 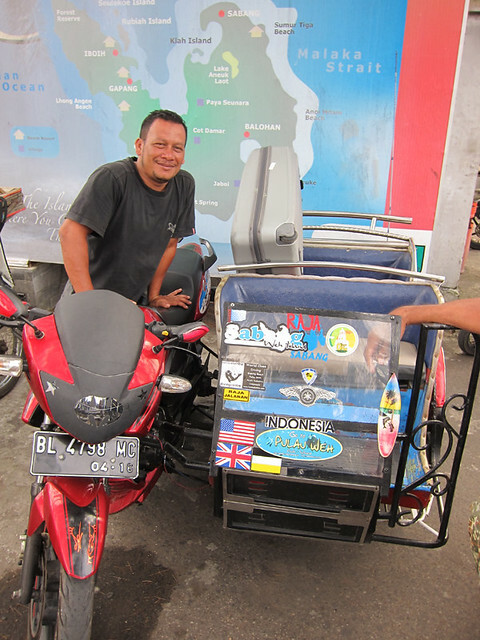 The next day, we engaged Lehman Becak again for an island tour (250,000Rp). He took us to an active volcano. It’s my first time seeing and being at an active volcano! # – The volcano, Gunung Merapi. That place smelled like rotten eggs and it was really warm. 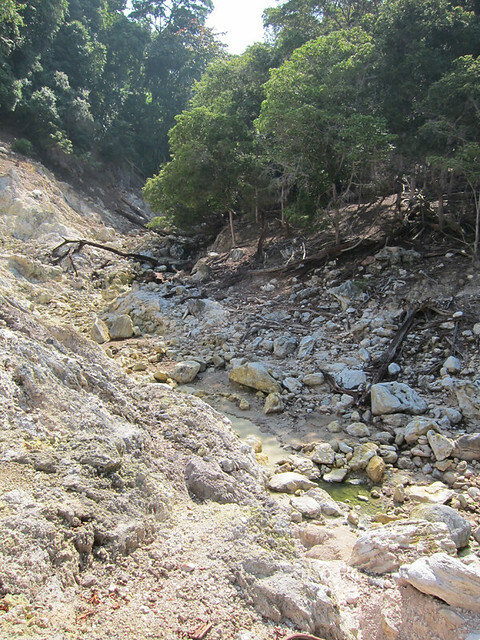 We also stopped by several spots with hot water springs. 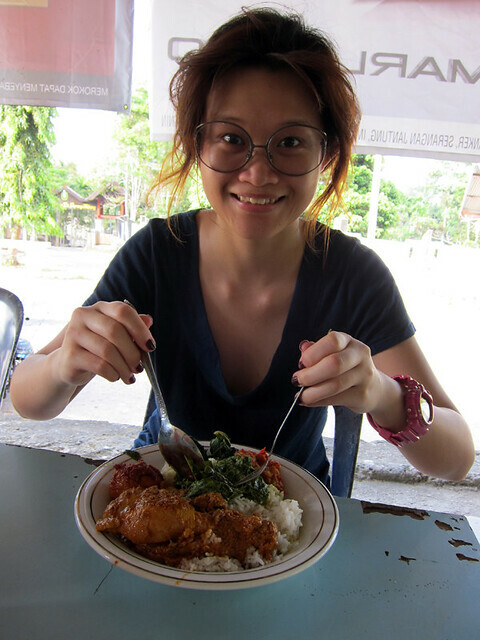 Then, we stopped at a quaint restaurant in Gapang for lunch. Gapang is the 2nd most popular beach in Pulau Weh. # – The delicious mixed rice in Gapang. My mouth waters thinking about it T_T. Check out my rickshaw hair. Next, we stopped by Iboih, the most popular beach on Pulau Weh for a drink. 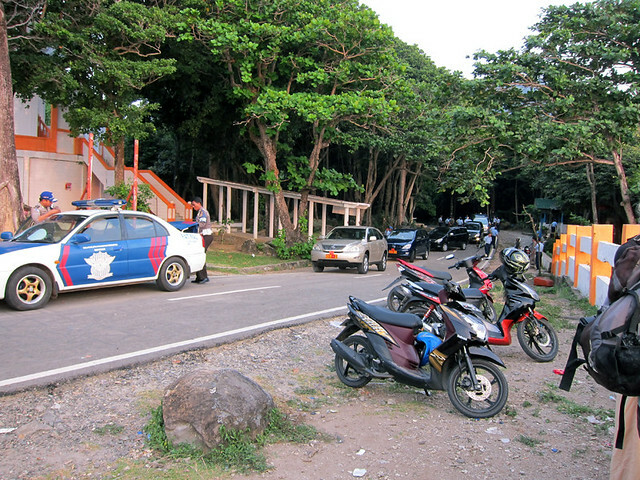 Most of the dive centres are located in Iboih. 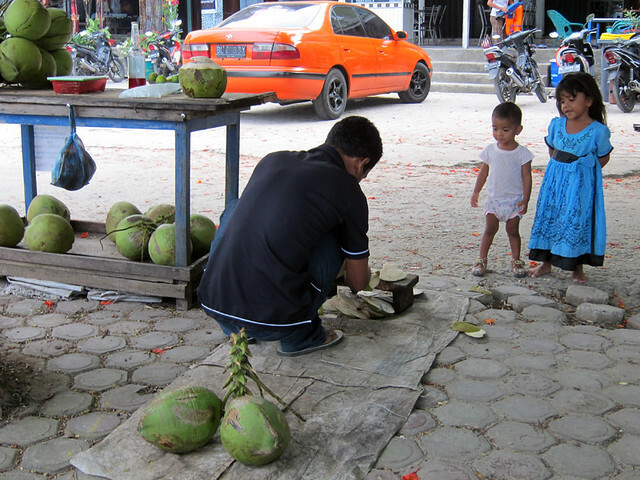 # – Man prepared our coconut drinks while 2 local children watched attentively making sure he would not screw up. 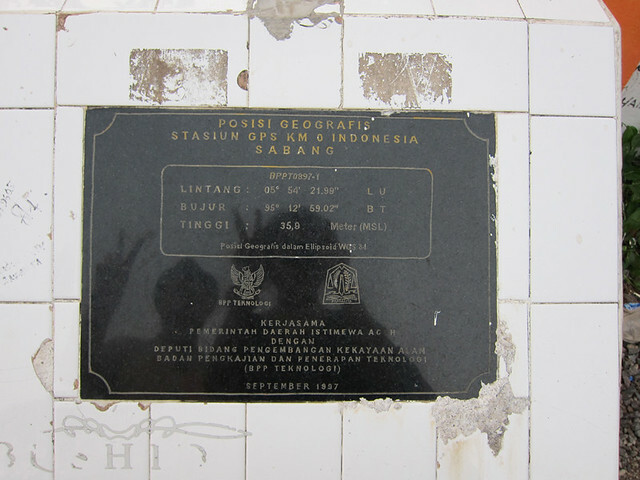 From Iboih, we made our way to the last destination of the tour, which was Kilometer Nol (or Kilometer Zero), the west most point of Indonesia. Coincidentally, a bunch of Navy officers and their wives were visiting from Jakarta. I assume they were very important & high up because there were tonnes of security. They were very friendly though, chatting all of us up. One of the guys told us that the west most point is technically about 2km away but it’s hard to get to so we’re actually really visiting “Kilometer 2”, hehe. # – All the VIP cars and their security. # – The TV crew. # – Beautiful almost sunset at Kilometer Nol. We got back and had dinner at Freddie’s again. Then off to bed. I think we were sleeping by 10.30pm every night. So healthy! The next day, Gareth’s birthday! We decided to dive on his birthday. 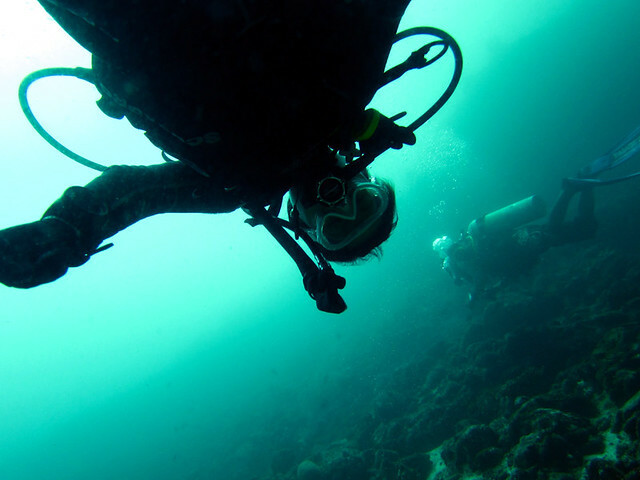 The dive centre we engaged was Rubiah Tirta Divers, located at Iboih beach. It is the oldest dive centre in Pulau Weh and has a very good reputation. 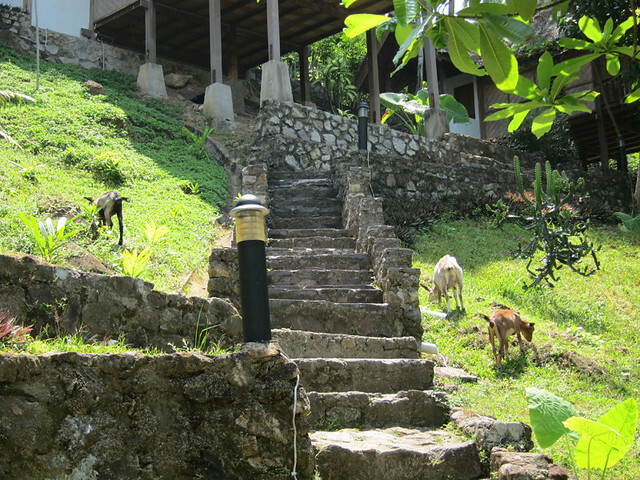 The owners are famous for their efforts in conserving Pulau Weh’s marine life. They picked us up from Casa Nemo in the morning and headed to Iboih, a half hour journey. We decided on 3 dives. 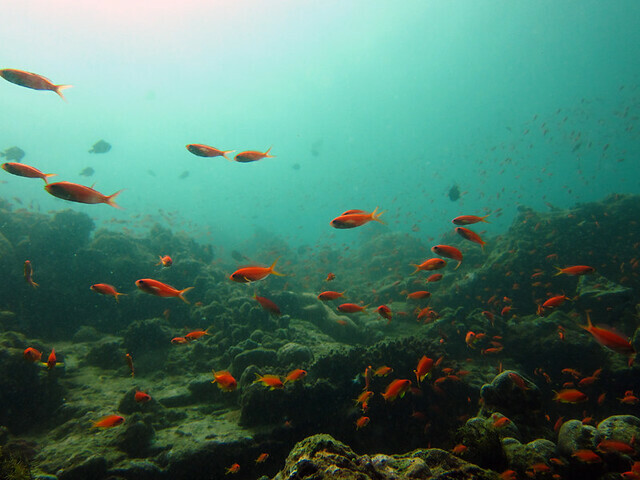 Each dive spot is less than 5 minutes away from shore. # – With the awesome divemaster, Mur aka Bandet. He’s got a good pace, he really knows the water and he’s funny! We had really pleasant dives. The visibility was decent about 15 metres & currents weren’t too bad too. 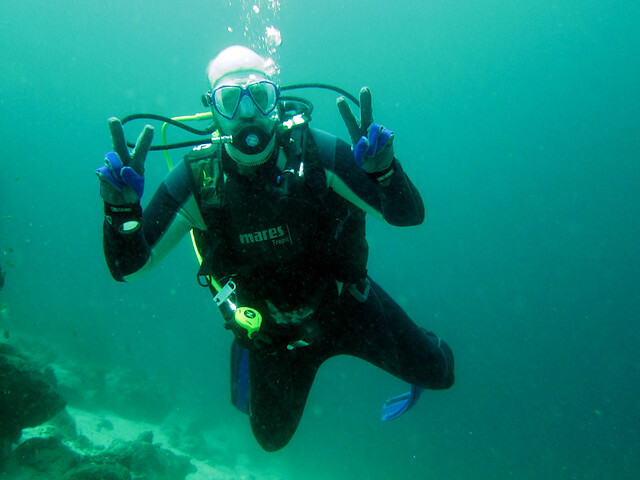 Most importantly, it was only the divemaster and us so we felt like we owned the sea hehe. By the way, if you’re ever at Iboih, you must absolutely eat the prawn sandwich at Dolphin, a restaurant next to Rubiah Tirta Divers. Dolphin also has free wifi. # – Best prawn sandwich in the world. Succulent prawn pieces with sweet fried garlics & onions sandwiched between buttery toasts. OMG!!! # – Watch for the friendliest cat in the world at Dolphin. 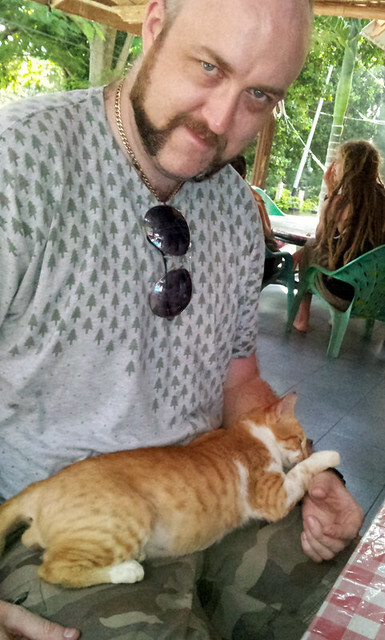 It just jumped on Gareth’s lap and promptly fell asleep. I have nothing but praises for Ferdy the man in charge of Casa Nemo. He made our stay at Casa Nemo extremely wonderful. He helped me arranged a surprise birthday dinner for Gareth and he did such a wonderful job! 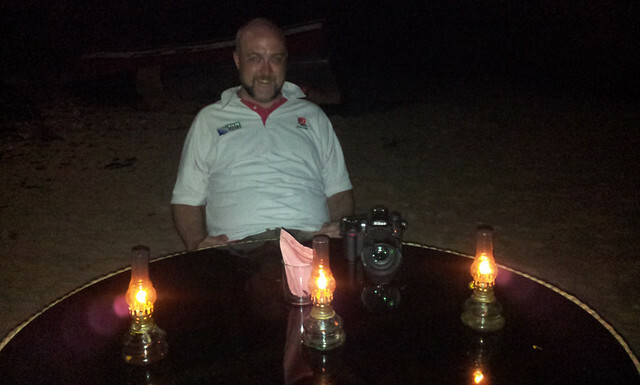 Eventhough Casa Nemo does not serve dinner, he specially got his sister to cook us wonderful Javanese dishes (they are from East Java) and set us a table right on the beach! We had the beach to ourselves! # – Surprise for the birthday boy! By the time we finished dinner, we were exhausted. Mustered up our last remaining strength to climb back to our room and fell asleep. Not even 11pm yet haha. # – Waving gallery at the airport. One of our best holidays together. Definitely going back! Why I decided to laser my eyes. 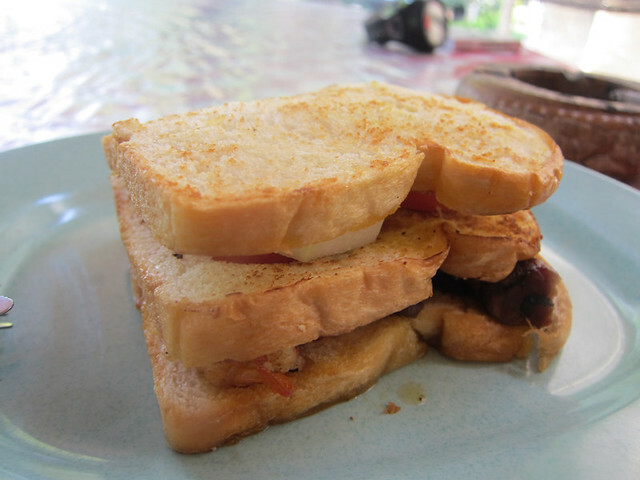 Three blog posts in one, yeah! 23 Responses to Our holiday in Pulau Weh (Sabang), Sumatra, Indonesia. What an amazing trip – THANKYOU! looks like it’s an awesome getaway!! not bad.. not bad at all!! Didn’t know about this place until you blog about it! A cool place indeed! Read about this place from Joyce’s blog also. Glad you had a blast! The personal attention showered by the hotel owner is every traveler’s dream! And lucky you manage to come back before the earthquake! Stay safe! My wife and me we are going to Casa Nemo(Pulau Weh)in September 2012 for 1 week.We go to Pulau Weh for one week of scuba diving. Thank you for this trip review. 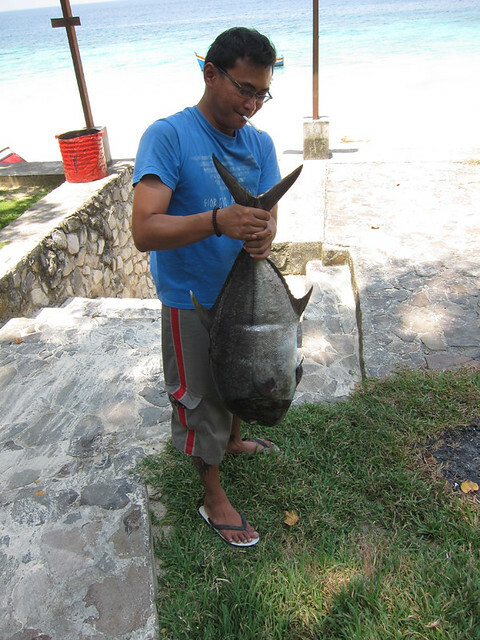 was the fish on liquid steroids? 1) We are undecided whether we want to bring our kids ( 2 girls, aged 3 & 5) with us. We’ve rough it out with them backpacking style when they were small , but thats only on Malaysian islands. Is this area suitable to bring kids around? My kids are easy, give them a beach and off they go. 2) is renting a motorbike the only way to get around the island? 3) did you have any problems with power at casa nemo? 5) how long is the journey from the jetty at Bandar Acheh – Pulau Weh? 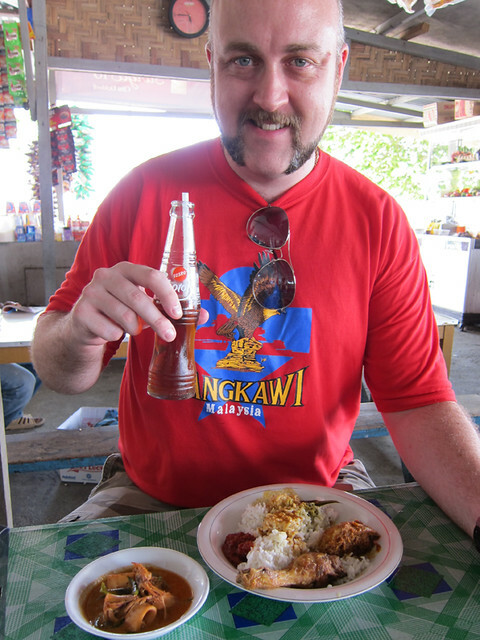 6) do they serve local Indonesian food around the resorts? am not too sure on this. we didn’t go anywhere else much by ourselves. we had a becak tour with lehman, our trips to Iboih for our dives were provided by the dive centre and we had a 1/2 hour walk down the road passing by just local houses for no reason lol. i think renting a bike might be a good idea if you’re thinking of exploring a bit more. truthfully when i was there, the waves at case nemo were a bit strong, and the beach wasn’t as powdery as say… redang. if u walked further down the beach nearer to freddie’s, the waves seemed a lot calmer (probably due to having large rocks breaking the waves) and i did see people snorkled there. freddie’s side seemed to provide snorkeling services. 1 hour for express ferry or 2 hours for ordinary ferry. 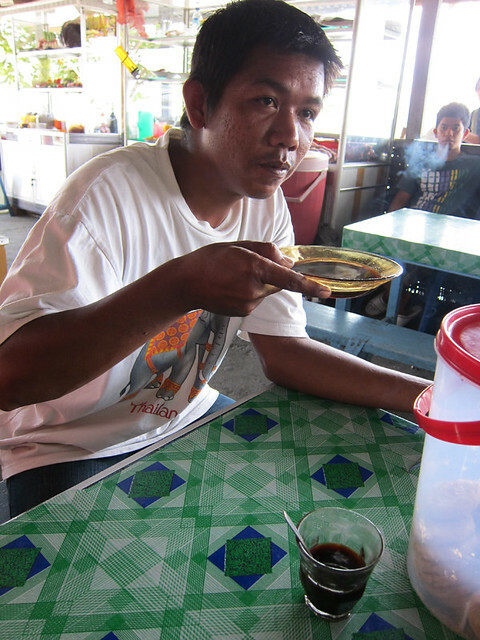 not at freddie’s, but when i was there i was told by ferdy they’re going to start operating the kitchen at casa nemo soon so perhaps you might get some good javanese food? personally won’t consider pulau weh as a place to go just for food. Thanks for the post! I am leaving for Aceh from KL this Friday. But it’s just a 4D3N trip. Didn’t expect Pulau Weh to be such a dive site! Reading your post about your trip in Sabang is heartwarming. I can feel that you had pleasant trip there. 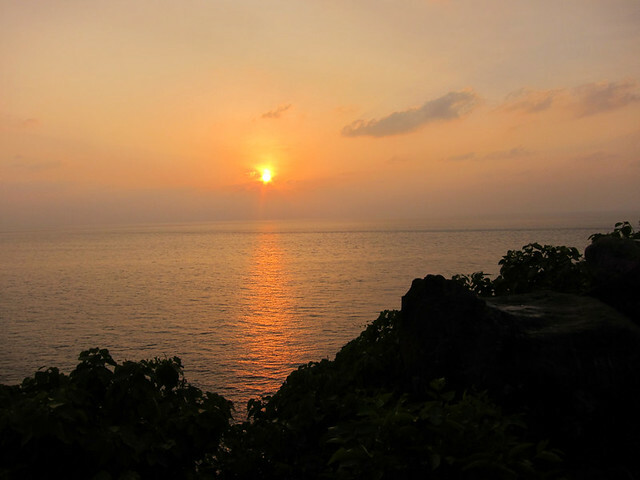 I wish I can visit Sabang in the near future. Hi..can i get lehman becak phone number?? Hi, may I request for Lehman Becak’s contact number? Thanks in advance. Hi Kimberly, I’m going to Pulau Weh next year, curious that most of the hotel have no air conditioner, will it hot for people like us? Malaysian? =D do you still remember? Pulau Weh Is a beautiful Island which I just visited in March (20th-25th) The people are very friendly and The resort I stayed Is calle mr.Bean Resort.All the rooms face the sea and allr equipped with hot water shoer and Air conditioners.New Beds and Pillows n Blankets.The owner is very friendly and very accomodating.I am definitely going back there again soon.He can also arrange dive packages with the Rubiah Tirta Dive Centre at very reasonable prices.Try it out.